The Amenity Sprayer Operator of the Year 2016 Awards was launched at BTME Harrogate this week (19 January). It is the second year of the prestigious Awards, which aim to reward top sprayer operators across the amenity industry, and to share their best practice to enhance standards for all. The Awards, run by the Amenity Forum are sponsored by ICL and Syngenta, and supported by BASIS. The 2015 winner of the Sports and amenity turf using a boom sprayer category, Andrew Kerr, Course Manager of West Malling Golf Club in Kent, highlighted the Award was positive recognition for the club and staff for the investment and attention to detail to consistently achieve accurate and safe spraying. "We were pleased to be able to share some of our experiences and practical ideas," said Andrew, "but also gained from talking to other operators and the judges, to pick up tips that we can use to further improve results in the future." 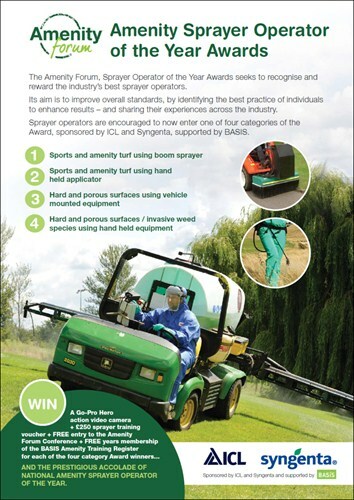 Application forms for the Amenity Forum Sprayer Operator of the Year 2016 are now available from the Amenity Forum and its industry members supporting the Awards, including ICL and Syngenta, or downloaded from the GreenCast website. 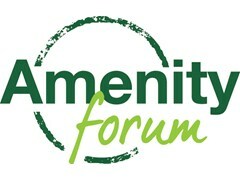 Amenity Forum Chairman, Professor John Moverley, highlighted that accurate and efficient spray application was an integral part of the commitment to fulfil the Sustainable Use Directive. "Best practice in sprayer operation will ensure the most appropriately targeted use of every application; the right product, in the right place, at the right time," he advised. "Every stage of the decision process needs to be addressed, to ensure treatments are being applied in the best possible way. "Better results will ensure businesses are getting the best value for money from every treatment, in terms of turf quality for golf and sports, through to weed control on hard surfaces and amenity areas. "Furthermore, achieving the best possible results from every application could reduce the need for retreatment and lower the overall use of pesticides." "The Sprayer Operator of the Year Awards have already proven a welcome way to recognise and reward the leading individuals and to learn from their experience." ICL Landscape and Industrial Manager, Mark Pyrah, added: "We congratulate all those who took part in the Awards last year. We are delighted to continue to support such an important cross-sector industry initiative with a continued commitment to raise standards and improve results. A short list of finalists will be visited by a panel of independent industry specialists to award the accolade of Sprayer Operator of the Year in each category. Each winner will receive a Go Pro Hero action video camera, along with £250 of training vouchers for further CPD. Entry to the Sprayer Operator of the Year Awards has been entered for BASIS and BIGGA CPD scheme points.